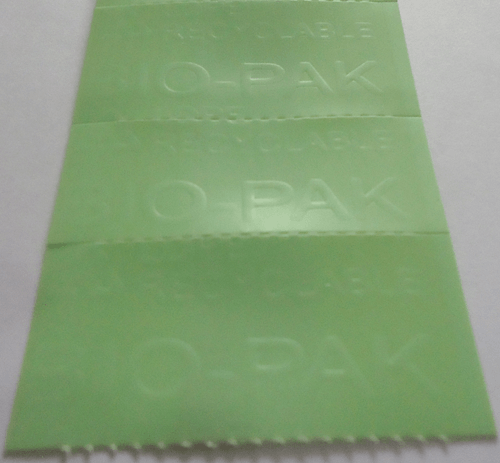 Bio-Pak Stickers and Sheets can be used for mold prevention in wide variety of consumer goods. Bio-Pak Active Packaging are a safe and effective method for preventing mold and are designed for many box packed items particularly footwear. Bio-Pak stickers are delivered in vacuumized barrier foil pouches and are easy to use with one or more stickers placed in the individual box at time of final packing. Bio-Pak Active Packaging is activated by moisture. 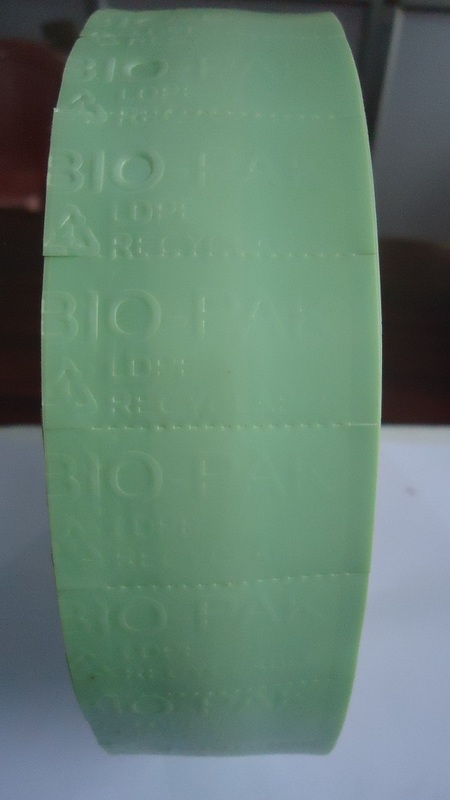 Bio-Pak stickers are not like other stickers which get activated as soon as they are manufactured. When the relative humidity reaches a pre-set level the stickers will create and release an atmosphere within the box to actively eliminate mold spores. As Bio-Pak stickers will not start to work until the humidity has reached a certain level you are assured that your product will be protected when needed. Function: Mold prevention for Leatherwear, Shoes, Garments, Woodenware, Electronics, Machinery & Hardware, Food, Agricultural Produce, Pharmaceutical, Freight forwarders, Optical devices, Military Instruments, Art & Antique products. Advantage: Bio-Pak Active Packaging is derived from natural plants essential oil, FDA, ECHA, EPA listed chemicals so it is natural, non-toxic and environmental friendly. It already passed a number of tests in SGS, DMF Free, REACH. Validity in One Year without opening keeps preventing mildew six Months. Bio-Pak PE Sheets are a safe and effective method for preventing mold and are designed for polybag packed items such as garments, bags, accessories, small leather goods all the way up to furniture. Bio-Pak stickers are delivered in vacuumized barrier foil pouches and are easy to use with one or more stickers placed in the individual box at time of final packing. Bio-Pak PE Sheets are delivered in foil sealed pouches and come in three sizes. 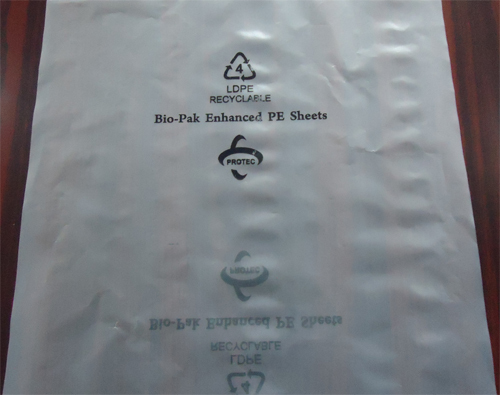 Bio-Pak PE Sheets are easy to use with one or more sheets placed in the polybag at time of final packing. 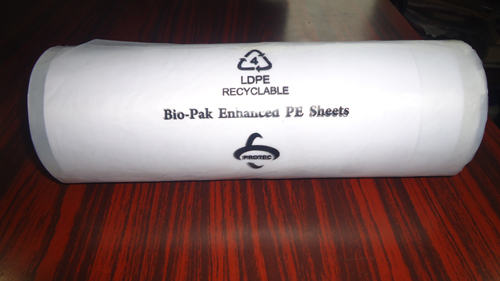 Bio-Pak PE sheets are activated by moisture. When the relative humidity reaches a pre-set level the sheets will create and release an atmosphere within the package to actively eliminate mold spores. As Bio-Pak PE Sheets will not start to work until the humidity has reached a certain level you are assured that your product will be protected when needed. The three sizes of Bio-Pak PE sheets enable you to select the most suitable sheet for your particular item and packing method. This will ensure that your product is fully protected at a minimum of cost.